The house is a very big masia which has been documented from XI century as the house of the feudal lords of the area. It’s about a group of houses that were built over the years making it a very big property with rooms for about 20 people. It has dining rooms, living rooms, kitchen, old chapel, interior and exterior, patios, balcony and gardens, and about 27 hectares of forrest, and land and panoramic views to the different mountain areas of the Montseny range. The rooms have all the necessary equipment, comfortable beds, blankets, light, electricity to connect devices, and some of them with a beautiful view of the different mountain. The masia also offers free use of laundry machine. The masia has three showers and three toilets within the house. Wi-Fi connection is available in many areas of the house. The kitchen is a very special place as it is fully equipped to prepare healthy and conscious food (juice processor, mixers for juice detox). By the way, one of the main rules of the house is that it is 100% vegetarian and vegan. There is a general heating system for all the house, and in each of the room, dining area, kitchen, halls, and as support electrical heaters and gas heaters as well. Check-out time and drop into train station maximum 8 p.m. and check-out from the room at 11 a.m. Originally from the former Soviet Union, Boris has lived for more than 12 years in the forests of India, developing a solitary practice of yoga and meditation. He shares the word of yoga to all who open their ears and hearts and is always looking to deepen and intensify his own practice. A beautiful soul, who always shares her positive attitude towards the life. She continues to bring so much to this beautiful Community; firstly, as a student of the YTTC, then as an enthusiastic assistant and at this present moment, as one of the main teachers. 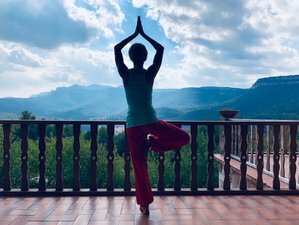 Her self-practice and commitment to the path of Yoga are admirable because of her consistency in all the fields, from the Hatha Yoga Practice, Meditation, Teacher of Relaxation techniques, Teacher of Anatomy, Teaching Methods, a Kirtan devotee and Karma Yogi. Her love and light are always shining. OmShanti is located about 40-kilometer (30-minute) away from the beautiful and international city of Barcelona in the Biosphere Reserve of Montseny (Sant Marti de Centelles) which has been proclaimed by the UNESCO as a Universal Heritage of Humanity. The food is 100 percent vegetarian and vegan. All of it is prepared with so much love by the hands of the family living in the house. Day by day, we learn how to cook healthier and happy as for us is an important part of our yoga practice. Breakfast, lunch, and dinner are included in the price and snacks and fruits during the day as well. OmShanti offers different activities depending on the teachers that are living in the house, therefore the activities that will be mentioned are not happening at the same time and are rotative. So might be that you do not do all of it in a four-day retreat. Permaculture work, handicraft workshops, therapy through dance, music, Reiki, taichi, chi gong, different yoga styles, meditation techniques, massage, love circles, word circles, psychological work, holy walks through nature, fire ceremonies, movie nights, philosophy classes, trekking along the nature, visit to rivers and much more. Spa treatments are not included in the retreat price and need to be booked in advance. Many kinds of massage, acupuncture, Reiki. As mentioned before, OmShanti is in the middle of the Biosphere Reserve of Montseny which makes the perfect place for people who are interested in nature, long walks, trekking, camping, animal sight, bicycle rides, extreme sports such as rock climbing, paragliding, rapids, etc. Also, as in most part of Europe, there are old ruins that go far back in time more than 2000 years old. Therefore, it is beautiful to find them in the middle of nature and also in the villages around, very close to the masia. There is the city of Vic, which has Roman Colosseum which is used right now as a museum and around it, there is a very old market with many organic veggies and thing. The beach and the beautiful Mediterranean Sea is just 35 kilometers' away, about 30 minutes by car and one hour via public transportation. There is a straight train from the house to the sea. The city of Barcelona has so much to say about it for lovers of arts, music, museums, restaurants, shopping, cinema, beach, and much more to do. Anyway, OmShanti Barcelona is in a strategic area which gives the fortune to be in nature and at the same time to be very well connected to city life. The ride takes about 15 to 20 minutes. Right away you will find the Plaza Cataluña Train Station. There, you will find the R3 train direction to Vic. In approximately 50 minutes, you will come to Sant Marti de Centelles station where OmShanti team will pick you up from train station to the house. You will go in their car about five minutes for 2.5 kilometers. Retreat center - Triple Canvas Tent "GLAMPING"